Getting Pretty Sick of This….Again. This entry was posted in Racing on October 21, 2011 by Steve Tilford. It was announced yesterday that Juan Pablo Dotti, AeroCat, was suspended for testing positive at Tulsa Tough this year. I’m getting pretty sick of all these drug positives and was kind of hoping I could avoid writing about it here so much. But, this is different. Again. I got an email from Rick Paulos, the promoter of Rock Island, forwarding me the article from Cyclingnews.com. I emailed Rick back and told him that it didn’t surprise me. Actually, I was surprised. I was surprised that he was caught. I’ve posted here that it is pretty easy to tell when someone is super-charged racing. This guy was so obvious. 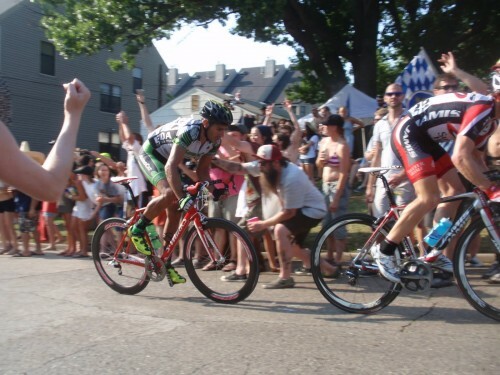 I was in the Tulsa Tough race he tested positive at. But, the race he popped on my list was the Rock Island Criterium over Memorial Day Weekend. I was in the break with him and some other guys on his team. It was a big break, around 15 and it kept splitting up. I was the only guy from TradeWind Energy there, so it was not a good situation for us. But the way that Dotti was riding that day was unreal. I was trying to mark everything, so I eventually got dropped out of the break. A pretty embarrassing day for me, but I usually race to win races and that is how I attempted to do it that day. I remember coming back into the field and saying to Josh Carter, Dotti’s team mate at the time, and a friend of mine, “your guys are on drugs, for sure.” I would not have said that if I wasn’t positive that was the case. And it was the case, obviously. So, two of the most important Midwestern race weekends, Memorial Day in Iowa, which is 4 races, and Dotti won two (plus 3rd in Snake Alley), and Tulsa Tough, which is a NRC race and he finished 2nd the hardest day, on a pit bike, were ruined because this guy was there. You can’t redo the races and he changed them dramatically. I’ve often wondered if someone actually makes these guys pay back their prize money like they’re supposed to. What to put bets on it? I bet not. And the money isn’t the issue really. But, these guys will never understand that, along with lots of other things. It’s so sad. Here’s the Velonews article on it, but I wouldn’t bother. They call the guy from Georgia. Juan off the front on Sunday in Tulsa. He kind of looks like he's hurting here. Wonder what he would have looked like if he was riding au naturel. Probably wouldn't have been in the photo. Nice post Steve. Marcotte got 2nd to dotti 2 days and then again to someone recently at nationals that was doping those are the people it’s really hurting. Maybe it is because I don’t race at their level but will these guys ever learn?? Like you, I am amazed, but not amazed, when they get caught. I sure hope the accolades they get in a minor sport are worth it. An apple does not fall far from the tree. There are still other apples hanging on that tree. They need a list of drugs that are life time bans. One and done. I agree with you, but the devil is in the details. Testing is still more art than science for many of the PED’s. Some PED’s have relatively simple tests, but complicated by other factors. For example, a clenbuterol positive in Europe versus the same positive in Mexico. Other drugs occur naturally with varying quantities depending on the human or are simply not obvious. It’s early days in drug testing. Lifetime ban for Masters for sure for positives. Domestic pros, I’m not sure what to do. It’s complicated by international travel. As long as one of the guys behind the Armstrong myth is running USAC and remaining closely associated with the UCI, it is reasonable to assume that there are many more to come. Hm. I can see why you get the hate comments here. I guess the authors don’t like a guy who calls a spade a spade, particularly the guilty. When a promoter (like me) looks at a list of banned riders, said promoter will notice that most of the bans have to do with bounced entry fee (I assume) checks. We’re talking $20 or $30 checks. One name popped out at me from the list I saw because this character owed $1800 or something – that was the prize money he owed back after testing positive. I don’t know if he ever paid it, but at least it was out there. USAC should make this list public and extremely easy to access. A little peer pressure would do wonders towards paying up $20 or $30.